The ASUS PCE-AC68 dual band AC1900 PCI wireless adapter is a new 802.11ac Wi-Fi PCI Express adapter which upgrades your desktop from tangle-some Ethernet cables to carefree industry-leading 802.11ac at up to 1.3Gbps. Plus, the stylish external magnetized antenna base gives you more flexibility in adjusting antenna placement to get the best signal reception quality possible. Powerful two-way transmission and a signal-boosting high-gain design give the PCE-AC66 improved two-way transmission that extends Wi-Fi range and coverage by up to 150% compared to generic client devices. This extended reach means the elimination of dead spots at any location, offering fast and uninterrupted HD streaming and smooth multiplayer gaming wherever you may be. Lastly, the added heatsink uses highly-conductive aluminum to remove heat from the chipset, ensuring greater reliability for non-stop operation. Lower temperatures translate into a more stable device in all climate conditions, even during hot summers, and greater stability means more consistent connectivity and longer product lifespan. Check out more here about this Asus PCE-AC68 wireless PCI adapter if you are interested! I previously used a powerline and experienced constant dc's ( on top of 25 mbps dl max when I have 100 mbps internet! :( ) So I figured I should buy this and see how well it performs. Works great once the driver is sorted out. Beta win 10 driver would not connect to internet on 5GHz but connected just fine on 2.5GHz. I tried changing the channels on my router with no luck. So I downloaded the older version and every thing was golden. Connected at 5GHz and I downloaded 10 gig on steam with no hiccups. Have a WRT1900 Linksys router I just needed a good adapter to go with it. I am on a gigabit internet connection and I get speeds of 400-500mbps up and down on this WiFi card, which is good, but not the absolute best. The major downside to this card is that it will not connect to 5Ghz bands greater than 44. Making this card practically useless to me. I was hoping to receive speeds of at least 600mbps up/down. But unfortunately the drivers are causing the card to not pick up my tri-band router's second (faster) 5.0Ghz band. This card is excellent for 99% of people with it's excellent antenna reception and reliability, but if you're looking for a PCI-E WiFi card that can connect to 149-161 5.0Ghz bands, look elsewhere. 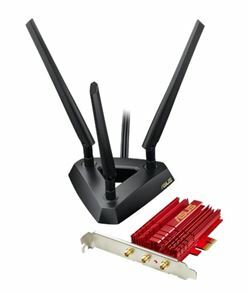 I have the ASUS RT'AC87U Wireless router. Before I connected this antenna to my server, I was getting between 130-450Mbps using a D-Link PCI-E DWA-556. With this antenna I am getting between 877Mbps-1.4Gbps. I consider this outstanding for simply adding an antenna. Experiment with the beam-forming option on the antenna; default out of the box is OFF. When I turned it ON, speed jumped to +1Gbps. The beam-forming speed ranges from 1-1.4Gbps, consistently. Antenna has excellent build quality; you feel and see its worth the money. My only comment on the down-side is the lack of documentation supplied in the box. When you go to the Windows wireless properties and view the options, there is some research to do for wireless optimization. But I am getting that wireless +1Gbps, so I don't think I need to tweak anything (yeah, sure..). The default settings seem optimum for my environment. But still as a hobbyist, you like to have that information close at hand... You always wonder "How fast can I get it to go..."
Return to top of "Asus PCE-AC68 Dual Band AC1900 PCI Wireless Adapter"! !